I’m not a lover of April Fools’ Day by any stretch of the imagination, but I look forward to it every year now for one reason and one reason only: to see what fake products ThinkGeek comes up with. And oh boy, they did not disappoint this year at all. This year’s illustrious line up. 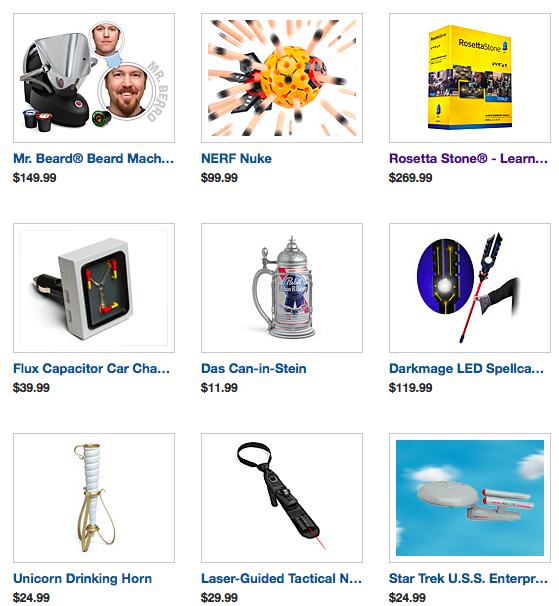 First of all, the front page of the website even includes past April Fools’ products for that extra touch of awesome. Minus the fact that it reminded me that the BMO Interactive Buddy never became a real thing. C’mon, Cartoon Network. Get on that! There are nine products in total for this year. Some are kind of eh, like the Das Can-in-Stein and the Laser-Guided Tactical Necktie, but most of them are out of this world awesome if only for the videos. They even collaborated with Nerdist to get Michael Dorn to endorse Rosetta Stone: Klingon! I was also a fan of the Starfleet Academy Extreme Frisbee league in the Star Trek USS Enterprise video. Of course, I wonder which products from this year’s line will become a real thing like Unicorn Meat and the Technomancer hoodie before them. I have my fingers crossed for the Darkmage LED Spellcasting Staff and the Unicorn Drinking Horn personally. Mostly because I want to be the most amazing staff spinning, hard drinking wizard at conventions. I know Sam wants the NERF Nuke, but that would seem like a hassle for dart cleanup later. I think we could all agree that the Flux Capacitor Car Charger in real life would be pretty awesome though. I should be sick of this by now, but I’m not. What do you think of this year’s Think Geek April Fools? What products do you want to become real in the future?